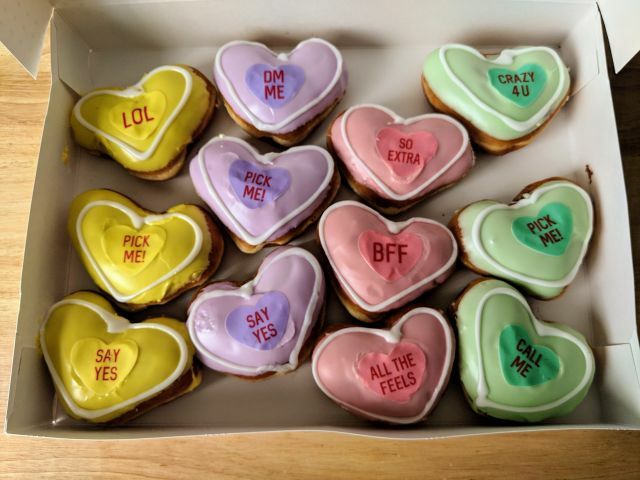 Krispy Kreme's Valentine Conversation Donuts are heart-shaped donuts with various fillings and feature a number of Valentine-themed sayings on top such as "Pick Me" and "BFF." I received these courtesy of Krispy Kreme. 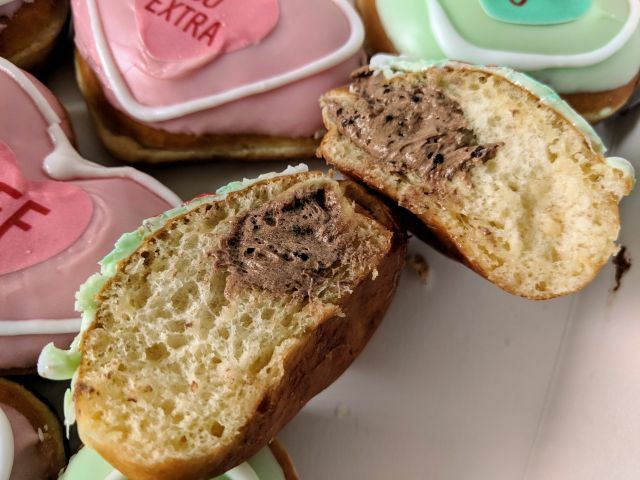 For the most part, the Valentine donuts don't offer much in the way of newness beyond the thin candy sheet that the sayings are printed on. The icing and filling are the same as you find on/in some of Krispy Kreme's regular menu donuts although the combination of strawberry icing and original Kreme are not found together on any permanent menu donut (and are mighty tasty together). 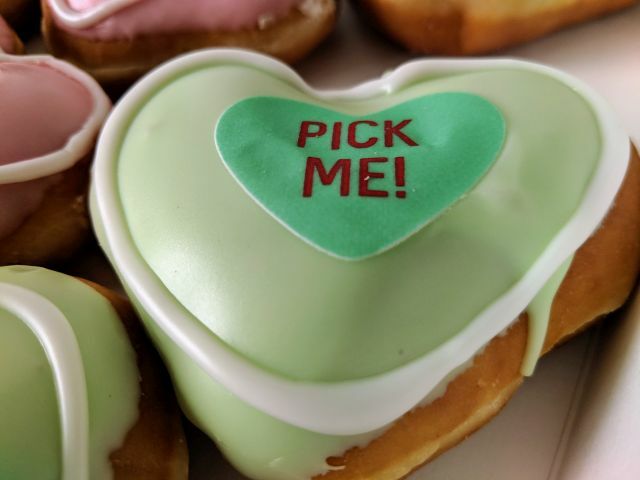 The yellow heart donut contain cake batter filling; the green ones contain chocolate kreme; the purple ones contain raspberry jelly; and the pink ones contain original Kreme and have a strawberry-flavored icing (rather than the plain icing of the other three). Of the four, the yellow donuts were the sweetest (and I was really glad they didn't glaze these before icing them). The candy sheet that the sayings are printed on (in edible ink I'm assuming) almost looks like a sticker and has that hard paper feel to it. It dissolves easily enough when you bite into it and has a slightly powdery quality. Tastewise, it's just like sugar. One last thing of note is the heart-shaped donut look to be a little smaller than Krispy Kreme's regular round-shaped filled donuts.